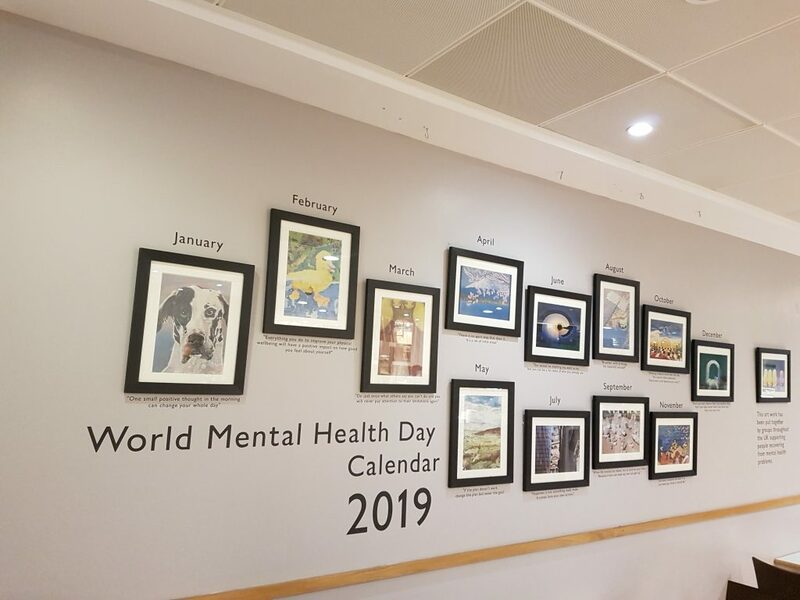 Altering Images of Mentality, together with UK groups and organisations supporting artists with lived experience of mental health problems, have produced calendars supporting World Mental Health Day and raising awareness of stigma and other issues. By getting involved, artists have their self-esteem and confidence raised; the process aims to be open and inclusive. The calendars are a collection of different art pieces illustrating what those with mental health issues face. 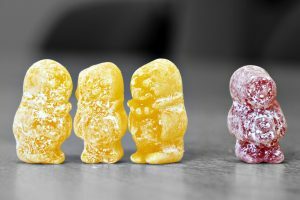 They bring into the limelight the problems faced by people with mental health issues by addressing the stigma and discrimination they experience in everyday life. We are very grateful to the contributing organisations that support their artists; they all get a mention in the calendar and free, hard copies in time for Christmas! From now on, we would love to see the images of your artwork, for free entry into the pool of images from which a panel of 3 judges (all artists) will select 13 for inclusion in the 2020 calendar. There is plenty of time to create and photograph your art. The closing date for the entry of images will be 23:59 on 29 September 2019, so there is time to be creative over the summer! Artists who have an image chosen for inclusion in the calendar will be notified shortly after and will receive a hard copy. The judges’ decisions will be final. Images will be placed in AIM’s Flickr album for the 2020 Calendar and in a Facebook folder. We would like artists to attach a titled image file to an e-mail, together with a completed questionnaire, which asks for details such as the name of the supporting group/organisation and some background information. E-mail: info@aimmentalhealth.org.uk. Download the questionnaire here (complete a separate questionnaire for each image). There will be no limit to the number of images submitted by an individual artist but only one piece of their artwork, best liked by the judges, will have a chance of inclusion in the calendar. Photographs/images should be of high resolution, preferably between 1MB and 6.75MB in size (the AIM mail box accepts attachments up to a maximum of 10MB). Copyright of any submitted image remains with the artist/photographer. 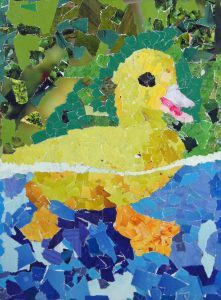 Artwork must be all of the individuals’/organisation’s own work. Individuals who submit work must own all rights to images and text used. Do not send in any content that isn’t yours or you don’t have permission to use. By submitting your images you are consenting to allow AIM to distribute and publicise your images and to use them in exhibitions, in the calendar and on its web site, on Flickr, on social media and in promotions. . If you do not wish to grant these rights please do not send in any images. If there are people in your photographs, please ensure that you have asked their permission, and if they are under 18, their guardian’s permission to have their image submitted. Background information may be used, together with selected images, on the AIM web site to add interest. Background information may include a ‘back story’ to the piece of art: its inspiration, its theme, the medium used, any comment that would be of interest. 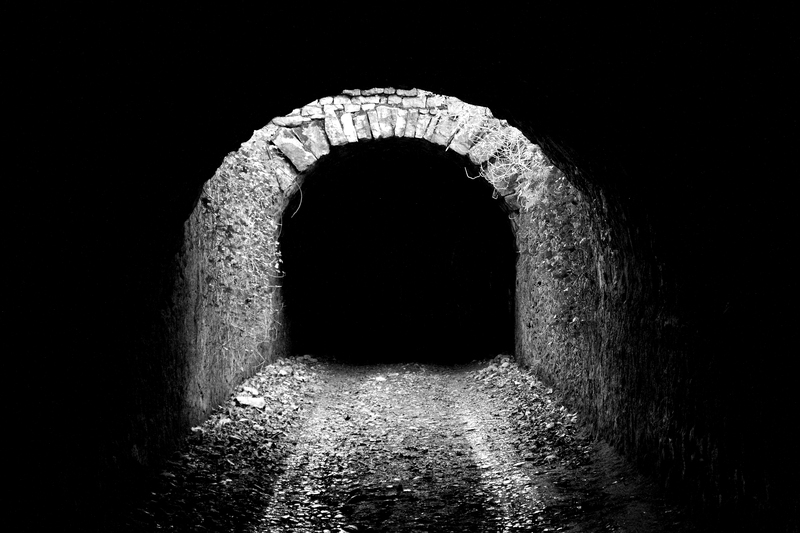 Artists may like to include some background information about themselves but please be careful to share only things you would be comfortable having published online. AIM will not use artists’ names. A .pdf of the calendar will be made available on the AIM web site for free download. We have been successful in securing a site to show off the 13 pieces of art that is part of the AIM World Mental Health Day calendar. This is now on display at the Brasserie at John Lewis in Eldon Square, which is on the second floor. The staff at John Lewis are delighted with the high standard of art and were happy to keep them on show for quite a while. So get yourself along and see how fantastic it looks, as it has pride of place on the main wall as you walk into the Brasserie. The art work has also been on display at the Hatton Gallery for a short period of time. We’ve also secured Wallsend Library to show off the art next year. Watch this space for dates. We are always looking for new venues to display the art work so please let get in touch of you know of any. The calendar is still available from this AIM website as a free download. We still have some hard copies available. If you would like one of these please get in touch. The download is free but a donation to AIM would be welcome. We are extremely grateful to all of the artists who contributed to this year’s calendar and wish to apologise to groups and individuals who submitted images that did not feature in the calendar. Thanks to Northumberland, Tyne and Wear NHS Foundation Trust for its generous grant towards the printing of the calendar. 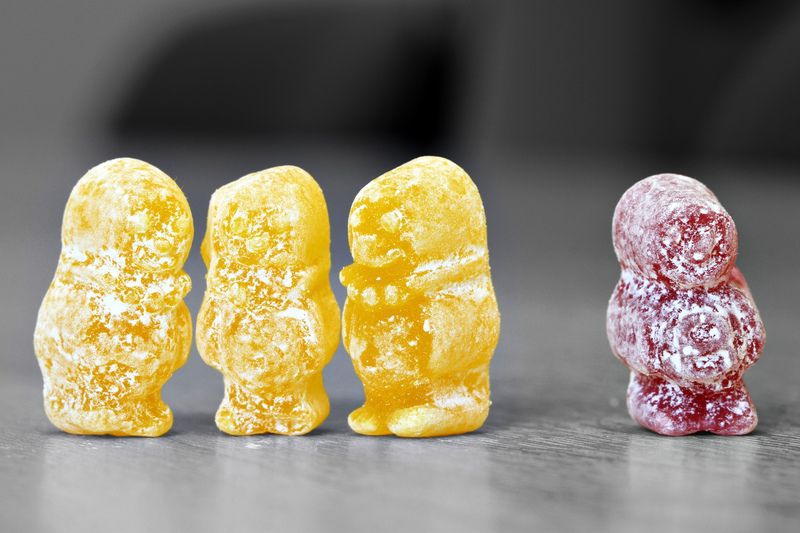 This photo is a close-up of four jelly babies – one being a different colour, and was designed to highlight the fact that one in four of us has a diagnosed mental health condition. 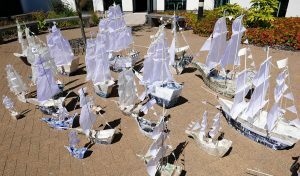 This is a photograph of model ships we at Hopewood Park made over a six month project for the Tall Ships Visit. This is a group collage from Hopewood Park.